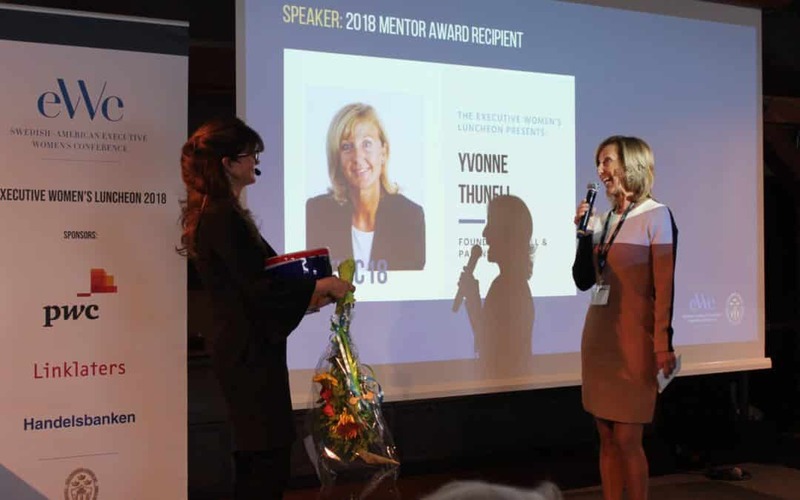 The Swedish-American Chamber of Commerce, New York (SACCNY) is pleased to present this year’s Mentor Award to Yvonne Thunell, founder of the leadership firm, Thunell & Partners. Ms. Thunell is also Chairman of Mentor Foundation, a leading international not-for-profit youth development organization established by H.M. Queen Silvia of Sweden in collaboration with the WHO. Ms. Thunell is an esteemed mentoring and executive coaching expert with a successful international career of her own. She has for the past ten years tirelessly and enthusiastically lead the very sought after SACCNY Mentor Program. As Program Director, she has played an instrumental role in cultivating a network of over 350 young female professionals and senior executive women, fostering and mutually rewarding professional development in an increasingly challenging corporate climate. Ms. Thunell has successfully connected young women embarking on a career in international business, with senior business leaders in international positions, including female leaders from multinational companies such as General Electric, JP Morgan, Skanska, Klarna, H&M, Volvo Cars, Accenture, SEB, Pfizer, and many more. The award, which traditionally honors a businessman who has extensively encouraged and supported women in business, is for the first time given to a woman. Previous award recipients include: Paul Duffy, Chairman & CEO of Pernod Ricard N.A. ; Dominic Barton, Global Managing Partner, McKinsey & Company; Jonas Prising, CEO, ManpowerGroup; Börje Ekholm, President & CEO, Ericsson,; Percy Barnevik, Chairman Hand in Hand International and many more. “I am deeply honored to receive this prestigious award it is a great pleasure to lead this program of talented international leaders and see their accelerated growth. SACCNY offers a unique network of the most powerful female leaders. The program offers an excellent forum to develop and pass on skills and experiences to junior leaders. There a strong value in bringing junior and female leaders together to support and inspire each other’s growth.” Yvonne Thunell, Founder, Thunell & Partners. This year’s Mentor Award was presented at SACCNY’s 17th Annual Executive Women’s Conference on May 3, 2018 in Stockholm. The event, hosted by the Chamber in partnership with PWC, Linklaters, and Handelsbanken, is a high-level platform and business networking forum for women in leadership positions in Sweden and the U.S.
Yvonne Thunell has long experience in mentoring and executive coaching. She has worked for over 20 years as a consultant for international corporations in developing leadership- and mentoring programs. Yvonne has held several international leadership positions within the Ericsson and SAAB Groups. She is also the co-founder of Ericsson Programmatic in the U.S. and has held the position as CEO for AXXA Corporation in Woodland Hills, CA. In Sweden, she co-founded Career Coach, a Human Resources consulting firm. Her clients are found in Stockholm, New York and Washington DC. Yvonne Thunell is the Chairman for Mentor International, a leading global not-for-profit organization focusing on youth development. Ms. Thunell was recently awarded H.M. the King’s medal for meritious efforts as Chairman of Mentor International and Mentor Sweden. Each year, the Award is presented to an individual who has significantly encouraged and supported women in business. This award was instituted to recognize and encourage mentorship within a variety of industries and is given solely on merit to commend a deserving business professional for their ingenuity and hard work, distinguishing themselves in their efforts to encourage and support female leadership. About the Swedish-American Chamber of Commerce, New York. Founded in 1906, The Swedish-American Chamber of Commerce, Inc. (SACCNY) is the preeminent Swedish-American transatlantic organization dedicated to the promotion, advancement, and protection of direct commercial relations between the United States and Sweden. SACCNY is one of the largest and most influential organization of its kind in the United States and is undisputedly the largest Swedish Chamber of Commerce in the world providing crucial support to Swedish and American companies.